Sidney Fire Chief Brad Jones, left, talks with Sidney City Manager Mark Cundiff, during the Shelby County Local Emergency Planning Committee’s annual exercise at the Sidney Police Department Wednesday, March 20. Jones and Cundiff were operating in the Emergency Operations Center (EOC). 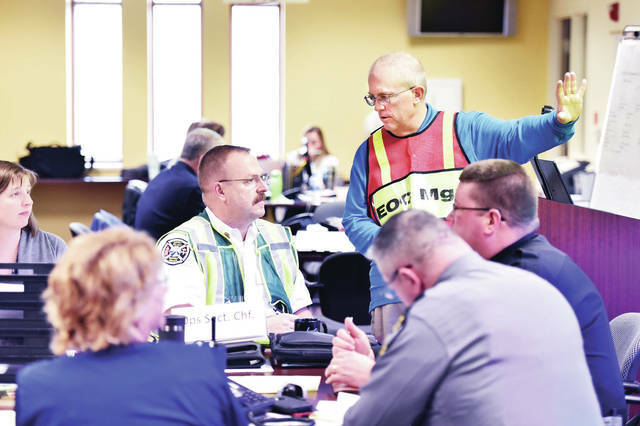 The EOC is a location designed to support emergency response, business continuity, and crisis communications during a major emergency or disaster. The functional exercise focused on testing the EOC’s ability to coordinate and support emergency response procedures.